This is our Stage I Motor/Gearbox kit for all Powerwheels Dune Racers, Dune Racer Extremes, Baja Racers, and Stingers. PLUS a Brake Reduction Module. The Stage I kit is a great way to add more off-road torque and speed without breaking the bank. It is the most power you can add without increasing your voltage. 2 of MLToys' Performance 550 Motors installed in gearboxes greatly increasing speed and torque. Torque sleeves added to both motors to help in tough terrain. 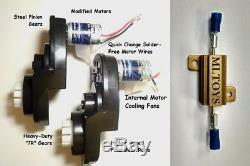 Motors have Internal Cooling Fans to help with longevity. Steel pinion gears for increased durability. Final gear ratio has been modified for even more top speed. Quick-change wire connectors that require no soldering to install and allow fast install/removal of gearcases! Motor/gearbox assemblies are tested in house and rpm matched to its partner for optimal power and efficiency. Video and paper installation and break-in instructions included. Tech support included so you're not on your own. But really, it's not hard to do! Our most popular electrical upgrade! Every time your kid lets off the throttle the car slams to a halt, bashing their head into the windshield and putting unnecessary strain on the gears. That's because of an electrical braking effect built into each Power Wheels. And as you increase voltage the effect gets stronger. This simple addition will greatly reduce the braking affect by simply adding it in-line to your existing wiring! Works with any voltage vehicle using a plunger-style foot pedal switch. Access the 3 wires under the gas pedal. Cut 3 inches out of the orange wire in (or the wire in the same position as shown in our picture) in a place where you can put the brake reduction module. This is NOT the same orange wire that leads to the motors. The module will get warm so the more space around it the better. Crimp the break reduction mod to the orange wire. If you want to screw it to the car you can. If it fits snug a little bounce won't hurt it. THIS WILL INCREASE THE STOPPING DISTANCE OF YOUR VEHICLE. Don't be fooled by folks putting toy motors into gearboxes and calling them fast! MLToys is the ONLY company dedicated to creating Modification Parts specifically made for Ride-On cars. Combine this package with our 18 Volt Conversion Kit to TRIPLE your power gain! Just like when modifying a real car, modifying a Power Wheels voids all warranties. MLToys bears no responsibility for damage to vehicle, persons, or property incurred by modifying a vehicle. Be Smart, Be Safe, and Have Fun! For more metal gear upgrades and higher speed customizations visit the MLToys website. The item "BRM + PAIR of Power Wheels Gearboxes & Motors for Dune Racers SPEED TUNED" is in sale since Wednesday, July 25, 2018. This item is in the category "Toys & Hobbies\Electronic, Battery & Wind-Up\Battery Operated\1990-Now\Ride On Toys & Accessories".toys" and is located in Dover, Delaware. This item can be shipped worldwide.